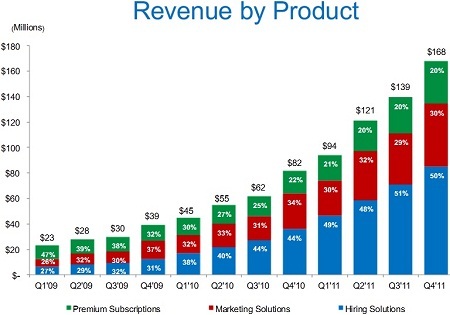 LinkedIn, one of the most popular social networks in the world and the most popular professional social network, has released its fourth quarter and yearly reports yesterday, revealing very interesting information about the growth of the company in terms of members, revenue and mobile while planning to test mobile advertising soon. The company has disclosed that it now has more than 150 million members, sharing the second most popular social networking site place with Twitter, far behind Facebook’s 845 million members but still ahead of Google+ (estimated to have 100 million users last week) although probably not for too long up ahead. More details that revealed are that in the fourth quarter LinkedIn had 92 million unique visitors, up 4.5% from the prior quarter’s 88 million visitors. Those visitors generated 7.6 billion page views, just the same as the prior quarter indicating that the user engagement went slightly down. Following the sayings of LinkedIn CEO Jeff Weiner in the earnings call, what probably driven much of LinkedIn’s traffic are the social network “Share” buttons that appears in websites of more than 300,000 publishers. The total quarterly revenue was nearly $168 million, increase of about 21% from the prior quarter and great jump of 105% from the fourth quarter in 2010. This was higher from the analysts expectations for $160 million which led to a jump of almost 9% in LinkedIn stock price (symbol LNKD) in the after hours trading. Most of the quarterly revenue came from the United States (67%) as the rate between U.S.-abroad stayed more or less the same as the last three quarters. The revenue rate between the different products also remained as it was over the last year where Hiring solutions generated 50%, Marketing Solutions generated 30% and Premium Subscription accounted for 20%. During the earnings call, Jeff Weiner has discussed a bit about LinkedIn performances in the mobile arena and future plans about mobile advertising. He disclosed that the company intends to invest in mobile as its LinkedIn’s fastest growing service which was responsible for 15% of the total visits to the social network. Weiner also mentioned that the company plans to begin experimenting soon with advertising and marketing for mobile devices as “the infrastructure is in place”. By that, LinkedIn is joining Facebook that also reported to launch mobile ads product of some sort very soon.